You are at:Home»News»Expo»EXPO NEWS: More new exhibitors than ever before! EXPO NEWS: More new exhibitors than ever before! 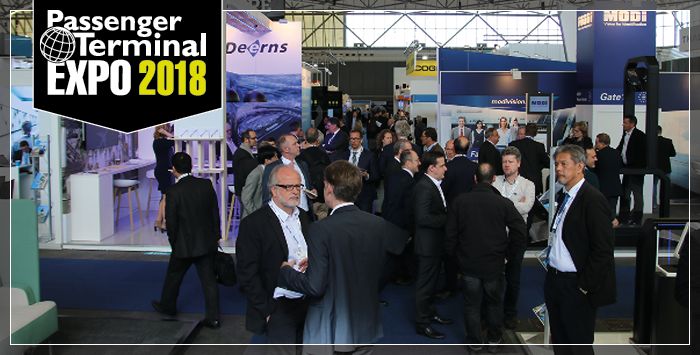 With over 280 exhibitors, this year’s Passenger Terminal EXPO in Stockholm, Sweden, 20-22 March, includes a number of companies exhibiting at the show for the first time. The following 10 companies will all be making their first-ever appearances at the show, providing a fresh perspective on the passenger experience, and offering airports a number of innovative solutions to keep them one step ahead of the technology curve. The expo is free to attend – register here. The large number of food outlets available in airports can sometimes make it hard for passengers to choose and physically find the right restaurant for them. After having queued for security, the last thing they want to do is queue again for food. The Grab app, which will be demonstrated at Passenger Terminal EXPO 2018, proposes a solution. Grab is an open platform that connects travellers to airport restaurants, retailers and services, allowing them to easily select one, place their order on their phone and then use the built-in wayfinding function to be guided to the right place when their order is ready. Already in use in a large number of US airports, Grab was recently introduced at Heathrow, Manchester and Birmingham airports and will soon be available at Gatwick and Stansted, with other airports in the UK and the rest of Europe expected to follow soon. Grab can be made available for airports as a standalone app, or it can be integrated into an airport’s or airline’s existing app – it’s now live within the American Airlines app. Alternatively, Grab has launched fixed self-order kiosks, which take advantage of the platform without requiring users to download an application on their phones. Delaware North has already installed a number of these kiosks at several of its airport dining locations. Kiosks can process orders from a location’s full menu, as well as ‘grab-and-go’ items. Grab has recently added barcode scanners for an even quicker checkout experience when purchasing grab-and-go items. The kiosks feature an interface designed for quick ordering, with intelligent upselling and customisation components, and includes secure card payments, including Apple Pay and Android Pay. More than 50 kiosks are expected to be installed at Delaware North-operated dining concepts by the end of the year. Drop by Grab’s stand at Passenger Terminal EXPO 2018 to find out how the app can increase customer satisfaction and revenues across a variety of restaurant concepts by providing engaging experiences and reducing queue attrition. Huawei, a global leader in ICT, is making its first-ever appearance at Passenger Terminal EXPO and will present its end-to-end airport cloud solution for the daily operation of airports, as well as its expertise in data centres, high-density broadband capabilities and big data analysis. IoT, big data analytics, cloud computing, intelligent video surveillance and broadband integrated communications systems are set to dramatically improve the passenger experience, while enhancing airport and airline operational efficiency and security. However, as IT systems have gained considerably in power and complexity over recent years, they have also put more stress on airport data centres and IT resources in general. This causes problems for large and small airports alike, which Huawei’s powerful, unified cloud solution can help solve. Huawei’s end-to-end Airport Cloud Solution divides resources into multiple pools, ensuring smooth service and flexible management of network resources. ManageOne provides unified management of cloud data centres, as well as IaaS, PaaS, data, DR and security services for stable and reliable centralised airport data management. Active-active and disaster recovery features prevent data loss, and HyperMetro and HyperReplication maximise security. Complementing its cloud solution, Huawei also offers a visual operational processes solution based on eLTE technology and its Integrated Communication Platform. The latter encompasses multiple communication methods such as trunking, video conferencing and telephone to aid communication within the airport and improve work efficiency. The company will also explain how its wi-fi indoor location technology can help airport operators quickly calculate passenger traffic and open or close the security check channels accordingly to improve efficiency. In addition, its high-density wi-fi enables passengers to use free wi-fi for entertainment and communication while they wait to board their aircraft. Huawei has provided ICT products, solutions and services for more than 50 airports, airlines and air traffic control authorities worldwide. Customers include more than 15 global airports with more than 30 million annual passengers, and the 10 busiest airports in China by passenger volume. In 2016, Dubai Airports partnered with Huawei to design and build the world’s first Tier III certified Modular Data Centre Complex (MDCC) at Dubai International Airport (DXB), the world’s busiest international airport. After one year, the data centre was inaugurated and ready to support the critical operations of Dubai Airports. For more information on Huawei’s latest projects and capabilities, be sure to attend Passenger Terminal EXPO 2018 to learn how the company’s expertise can help your airport continue to grow. Security personnel specialist I-SEC will present its recently launched software division, I-SEC Advanced Systems (AS), at Passenger Terminal EXPO 2018. Visit its stand to discover a suite of interconnected security and manpower tools. After 20 years in the airport security business, I-SEC found that there was no suitable software that could manage its security staff and efficiently process passenger data, let alone a complete software suite where the individual modules are in constant communication. It therefore decided to develop the software itself. I-SEC AS proposes two manpower tools and two security tools that have been proven and refined over recent years in I-SEC’s own security operations. SARA (Security Airport Real-time application) bridges the gap between HR and operations by tracking where agents are at all times, what they are doing, what they might need and linking that with HR files, training results and more. At the same time, it digitises all these departments, taking a further step to a paperless airport. The other manpower tool, ROM (Real-time Operation Management), is a resource planning application that allows collaboration from different devices at different locations to easily perfect the planning on the fly. Complementing the manpower tools are the security programmes, I-Check and NAPS (New Advanced Profiling System). I-Check is a passenger processing tool that scans boarding passes and passports using a standard tablet. I-SEC claim the gains in speed compared with standard scanners are ‘outrageous’. The system is flexible and can easily accommodate additional features such as a blacklist. All modules are standalone, but using them together offers large efficiency gains, as they can all be connected. For example, if one of the security applications detects a large delay in check-in, it can notify the security staff through SARA. AOE will showcase its Omnichannel Multi-Merchant Marketplace (OM³) – a suite of solutions to crosslink travel information, services and shopping along a passenger’s journey, thus creating a powerful online marketplace. Airports have a high volume of passengers, who are accurately known, identifiable and locatable through the flight data, with the airport controlling the entire infrastructure. This makes them the perfect platform for transformation to a digital integrated passenger experience. OM³ enables complete customer interaction across multiple touchpoints. It covers all channels: end customers’ various devices, individual retailers’ own product systems, airport services and flight information. The end result is not only a seamless personalised shopping experience for the end customer, before, during and after the flight, but also a powerful marketing tool and, ultimately, increased sales. OM³ was initially implemented at Frankfurt Airport, where it had immediate results, reversing the downward trend in travel retail. Heathrow and Auckland airports have since announced they will also adopt the suite. Queues can be annoying, so uFirst has developed a free-to-download mobile application that allows passengers to skip waiting times for a fee. Using a QR code displayed on their iOS or Android device, passengers are granted access to VIP lounges or fast-track services at security checks. Already in use in airports and tourist attractions throughout Italy, Spain and France, the app has also been rolled out in airports including Nice, Charleroi and Budapest. Stop by uFirst’s stand for a live demonstration and to discover more. Topsystem Systemhaus has recently expanded its Aviation suite with APHIS, a software package that takes care of the extremely complex task of workforce planning. APHIS stands for Aviation Personnel Handling and Information System and combines various planning, information and dispatch tools in one, enabling an efficient and reliable staff rostering. APHIS makes it easy to create workforce plans and shift schedules, which are otherwise time-consuming and often error-prone. In addition, the tool enables reliable management of the service level agreements (SLAs) with airlines. The personnel planner is able to deploy schedules easily and intuitively based on the stored information about the qualifications of employees and flight data. The software takes into account various working hours and break time models as well as individual shift requests of employees, to ensure seamless day-to-day running of the airport. At the recent inter airport Europe trade show, APHIS was awarded the Innovation prize in the interDATA category for its potential to reduce costs, optimise personnel deployment, avoid idle times and increase planning efficiency. APHIS is already in use with AHS at Munich Airport, who reported considerable cost reductions in passenger handling and operations were reported. Hong Kong International Airport is showcasing its new mobile check-in kiosks, called iCUSS, at Passenger Terminal EXPO 2018. iCUSS is the result of a two-year study on how to streamline the check-in process, and is claimed to be the world’s first ‘hot-swappable battery-powered movable check-in kiosk’. The kiosks have self-service and full-service modes and can be rapidly deployed and relocated to cater for changing passenger flow. As such, they offer greater freedom and flexibility to serve passengers throughout their journey through the airport. Head to Hong Kong International Airport’s stand for a demonstration of iCUSS and a series of other technical innovations. Fasttraxxx is launching a mobile app that enables passengers to take themselves out of airport queues and pay for a fast-track service through security, immigration and executive lounges. Fasttraxxx recognises that giving passengers a choice is an expectation and that passengers want control of how they spend their time in the airport. The company also understands that all airports have different capabilities and constraints in processing passengers, both in security and immigration queues, which is why it offers a fully flexible solution to suit different operations. From simple ‘scan and go’ to a fully integrated approach with access gates, the app can help passengers enjoy the experience of not queueing in the airport. Visit Fasttraxxx’s stand at Passenger Terminal EXPO to find out more about how the service can help airports increase revenue free of charge. SEMA World, a worldwide leader in blast containment, will present its newest anti-terrorism security solution, Absolute Shield, at Passenger Terminal EXPO 2018. Absolute Shield is a barrier that is anchored into the ground or floor to protect against vehicles, bombs, IEDs and gunfire either inside or outside the terminal. It features an anti-ricochet system that blocks bullets at angles as low as 10°, stops fragmentation and diverts blast waves from explosions. Available in two widths, Absolute Shield can be combined with a number of accessories such as tables, benches and seats, to ensure it blends into any environment, inside or outside. SEMA World will also showcase a number of other products, such as its Ground Bomb Killer, which is strong enough to neutralise the outward blast of explosives, but allows a portable x-ray machine or an explosive detection dog to determine whether a suspicious item poses a threat. Also on the stand will be the Aircraft Bomb Killer, which reduces the damage of a bomb on a plane. Seikodo will use Passenger Terminal EXPO 2018 to demonstrate how it can brighten up check-in with its new multi-colour baggage tags. With up to eight available colours, previously wasted baggage tag space can now be utilised for striking advertising. Multi-colour printing also enables clearer and easier-to-understand instructions for passengers still unfamiliar with the self-service bag-drop process. Meanwhile, RFID technology makes sure bags are accurately tracked every step of the way. Seikodo supplies RFID-equipped tags, priority tags and TSA security labels, all with a strong focus on reducing costs. Its tags were part of the recent rollout of self-service kiosks at some of Japan’s major international airports, including Haneda, Narita and Kansai. This year’s Passenger Terminal CONFERENCE will include a track dedicated to the ongoing digital transformation of the passenger experience and airport environment. The ‘Technology: Digital Transformation’ track runs all day on Wednesday 21 March. Mohamad Al Agha, senior manager IT business solutions, Abu Dhabi Airports Company, will discuss what digital transformation for airports means and what are the common enablers, approaches and challenges. Oliver Reindl, chief information officer, Flughafen Köln/Bonn GmbH, will show how to go through the process of big data analytics to get answers to dedicated questions for operational improvements via a case study from Cologne/Bonn Airport. Click here to see the full programme and to register for your conference pass (rates apply).